Mount Etna, an active volcano, always a looming threat is blanketed with forests and patches of lava deserts. The Etna can be seen from any corner of Sicily, a constant presence. It has been part of Ancient mythology (it was where Platone and the Titans lived) and literature, as it is mentioned in the Odyssey and by Aeschylus. It emerged about 35,000 years ago. Over history, eruptions, almost annually, have caused many deaths. Some eruptions have even seen lava reach the sea. In the 17th century it destoryed sixteen towns including Catania. Sicne Patrick Brydone’s ascent in 1773 on the north and south slopes many have climbed the mountain and lost their lives. Piano Provenzano and Refuge Sapienza on the north and south slopes are on the climb up. Tourist information offices such as the one in Catania provide information. Other information points are at Parco Naturale dell’Etna’s tourist office, at Rifugio Brunek (tel. 095 64 73 52) and Rifugio Sapienza (tel. 095 91 63 56), and at Linguaglossa there is another tourist office (www.prolocolinguaglossa.it). 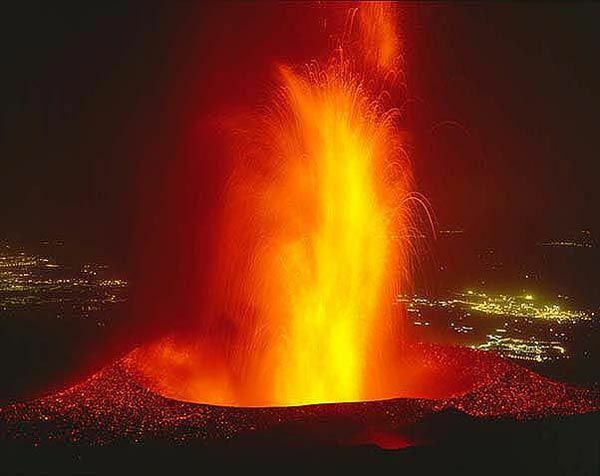 www.etnaonline.it giving information on the volcano history and activity and route to the top. Ascent of the volcano summit is however prohibited. 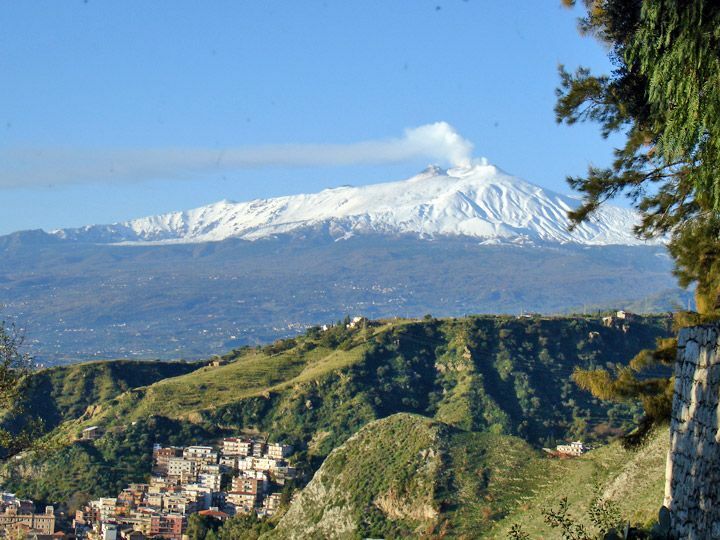 The Etna features four summit caters, 20 smaller craters and is 7 km by 5 km. Hiking boots, essential for the slippery terrain, warm garments, gloves, compass, sun-cream, hat sunglasses, drinking water, and sleeping bag and torch for campers. To reach Rifugio Sapienza there is a bus leaving from Catania. From the refuge there is a cable car ascending the Etna. You can find information linking www.funiviaetna.com. From there you continue on foot or take a bus with a guide. The ascent on foot takes about 4 hours as far as the crater area up to where visitors are permitted. Ascending by cable car is just as marvellous an experience for the scenic beauty and southeastern crater that you will be able to admire. With a guide you can see the Bocca Nuova (new recently created crater), which is still hot. You can also see the Valle del Bove and its sheer drop. In the eruption of 2001-2003, the ski resort, refuge and lifts of Piano Provenzano were eradicated by lava flow from the volcano. Slowly but steadily the facilities are being rebuilt and it is again possible to ascend the crater on foot (taking trekkers about 3 hours). To reach Piano Provenzano it is necessary to have a car as public transport is nonexistant. The mountainscape is different form Rifugio Sapienza as there are forests of Pineta Ragabo where people relax and picnic. For visitors who are coming in the summer booking in advance is a must. Rifugio Sapienza has its own restaurant. The restaurant at Hotel Airone is a recommended place for dinner. Rifugio brunek ‘s restaurant (tel. 095 64 30 15) focuses on dishes prepared with local produce. The restaurant at Hotel Scrivano is a popular place among locals, definitely a good sign. BY BUS: there are buses serving Catania-Rifugio Sapienza departing from the car park in front of the railway station and going along Via Nicolosi. There are buses serving Linguaglossa-Fiumefreddo. From here changing bus you can head for Taormina, Catania or Messina. BY CAR: follow the same route as the bus linking Rifugio Sapienza –Catania. BY TRAIN: the Ferrovia Circumetnea www.circumetnea.it, run privately, goes around the Etna.